Sock monkeys are so cute. I’ve always loved them and now they are coming back…and in new eco-friendly styles. Originally sock monkeys were created as a symbol of America’s ingenuity and perseverance during hard times. 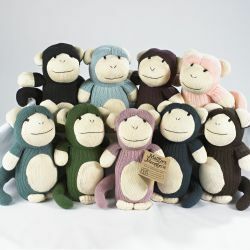 The first sock monkeys were created during the Great Depression by imaginative women (housewives). Today Maggie’s sock monkeys are also a symbol of hope and perseverance—with a modern, organic twist. 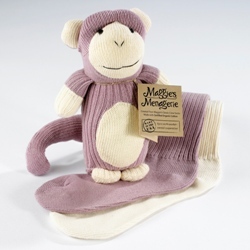 Maggie’s Organics, a 100% worker owned cooperative in North Carolina known for their organic socks and clothing, is adding sock monkeys to their line up. In late October, Maggie’s Organics will be selling these fabulous little sock monkeys made from their leftover organic socks. They are 89% certified organic cotton, 10% nylon, and 1% spandex on the outside and the inside stuffing is made from post-industrial polyester fiber scraps collected from fiber mills. These are great because they keep excess socks and polyester scraps from ending up in landfills, plus they are 89% organic. As soon as I pulled my sock monkey out of the package my little guy (he’s two) came running up to me saying “who who ha ha, ” that’s his monkey noise. He grabbed the blue sock monkey and ran off with it. I had to track him and the monkey down so I could finish inspecting it and remove the tag. Being organic is a big plus. The only thing I don’t like is the polyester fill because it will probably still produce a bit of poly off-gases but I gave it a good sniff and it doesn’t have that new smell so many toys and stuffed animals have. But to make it super eco-friendly, maybe in the future they will consider stuffing the monkeys with bamboo or organic cotton fiber fill. The real critic doesn’t care about polyester fiber fill though. He’s been carrying that monkey around with him all day. His sister (she’s nine) is going to be so jealous, I’m going to have to buy her an sock monkey. I’m betting everyone may want one. I think organic sock monkeys are going on my Christmas list of things to buy this year. Good thing they come in a selection of colors.